We are a leading Manufacturer of self drilling screws from Hyderabad, India. We are one of the leading organizations engaged in manufacturing, supplying and trading Self Drilling Screws. The screw we offer can tap its own hole as it is driven into it. 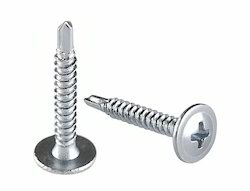 These self-tapping screws are used in a variety of applications ranging from DIY carpentry to surgery. Moreover, many dental implants and orthopedic bone screws are examples of self-tapping screws that are used in surgery. Looking for Self Drilling Screws ?